I am still figuring out what it means to put down roots. 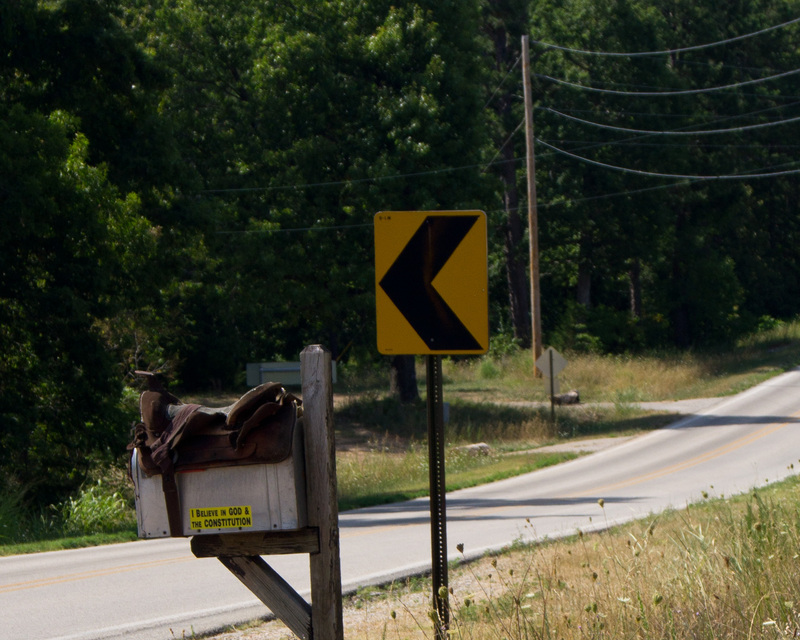 The Ozarks seem like a good place to try. 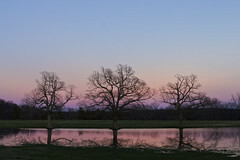 It’s not only because of the landscape or the historic neighborhoods in Fayetteville or how long I have lived here. Much of it has to do with friends, fellow artists, colleagues, students, and strangers in coffee shops and stores and bars, at the fantastic public library, or on First Thursday at the Underground. Mostly, however, it is the stories. They may be the reason why I consider the Ozarks both home and not. While I have been shaping my own stories for years now and love hearing others’, there is more going on around here than I or anyone will ever be able to know. The longer I live in Fayetteville, the more I am amazed by the density of history surrounding me–history born from a continuity of daily events and from the connections between people. (I like that in German, “story” and “history” are the same word: Geschichte.) Driving down old highway 71 for the first time in a year or so, I notice that a favorite view of a log cabin is now blocked by a huge new metal barn. When I mention this to a friend, I am only mildly surprised to find out that my friend not only knows why the barn is there but also who owns it, what the owner does for a living, and that he is well-known for what he does. By now, I’m expecting stories to involve the strangest links. The more I learn, the deeper the mysteries reach. I like tracing networks made by time, place and human relationships. I am intrigued when I come across a place I know nothing about. I am not aware of the connections, but I am sure there are stories–someone’s patterns and memories. Every corner holds worlds. 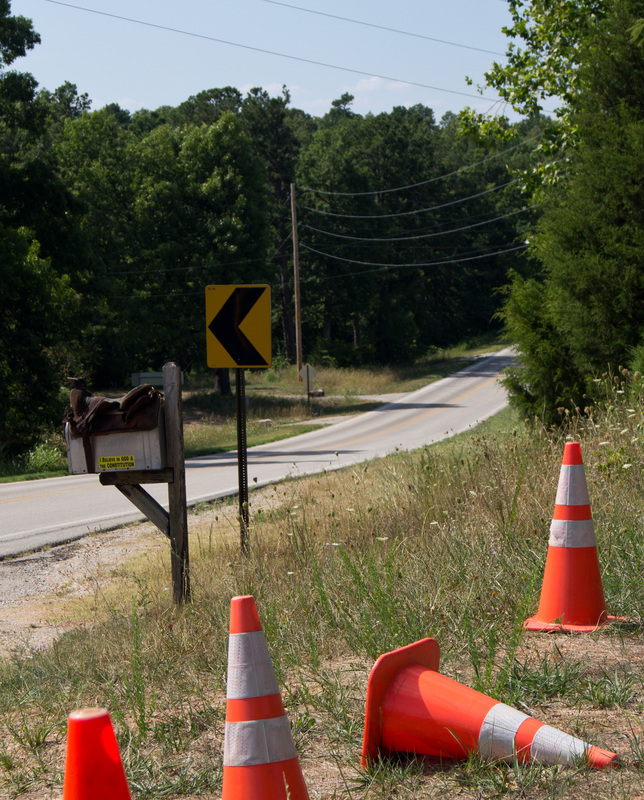 A couple of weeks ago, I stopped at the Y junction of two highways near the Benton and Madison county line. I noticed odd things that hint at stories I may never know–until I mention what I saw to someone who remembers. Sooner or later, that’s bound to happen. 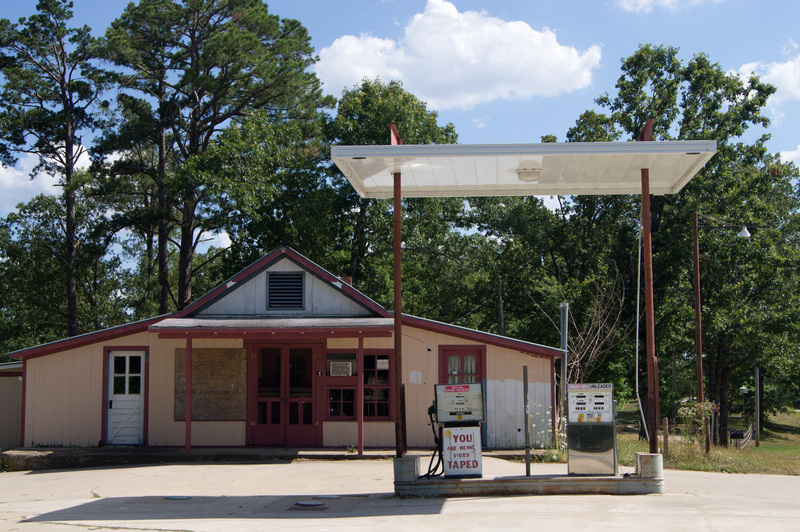 Abandoned gas station in an old community named Lookout–a detail that adds a little irony to the “YOU Are Being Video TAPED” sign. Many things are going on here. From here, things can go either way. 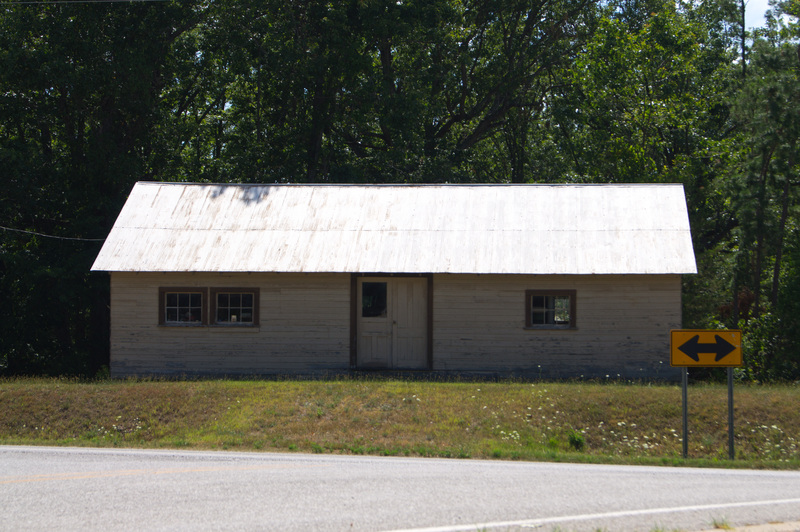 The building is another fine example of the clean and practical design often used in vernacular architecture in the Ozarks.